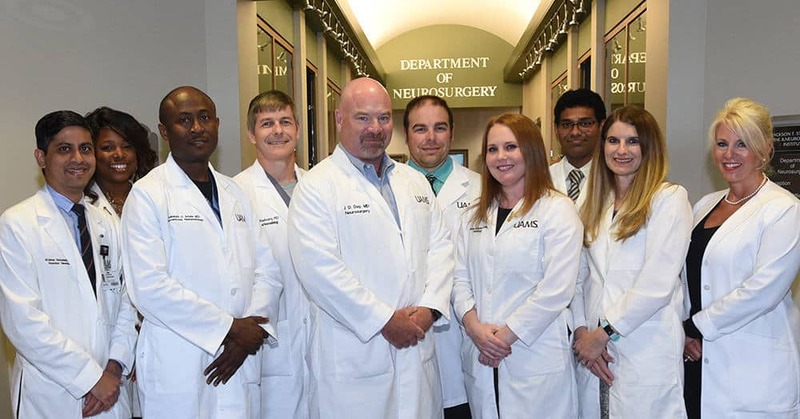 Seen here outside the UAMS Department of Neurosurgery, the UAMS Medical Center stroke team along with other UAMS physicians and staff recently achieved Comprehensive Stroke Center desgination for the medical center. July 13, 2018 | July 13, 2018 | UAMS Medical Center has become the first and only health care provider in Arkansas to be certified as a Comprehensive Stroke Center by The Joint Commission. The Joint Commission is an independent, not-for-profit organization that evaluates and accredits more than 20,000 health care organizations and programs in the United States. “Achieving the standard of care required by The Joint Commission to be certified as a Comprehensive Stroke Center means a stroke patient at UAMS has a better chance here than anywhere else in the state of not only surviving but leaving our care with the best possible health outcome,” said Martin Radvany, M.D., a professor and chief of Interventional Neuroradiology at the University of Arkansas for Medical Sciences (UAMS). According to the Joint Commission, the certification is the most demanding accreditation and is designed for those hospitals that have the specific abilities to receive and treat the most complex stroke cases. It also means certified hospitals can provide endovascular procedures and post-procedural care and has an Emergency Department with a dedicated stroke-focused program. “This is truly an extraordinary accomplishment that will save lives,” Patterson said. In July 2017, UAMS formed a team to work on getting the Medical Center ready for the Comprehensive Stroke Certification. A gap analysis was performed to show what points of care needed to be addressed for certification. Multiple aspects of the stroke program had to be documented as well. An application for the certification was sent to The Joint Commission in August. In May, two commission surveyors conducted the comprehensive survey over the course of two days. They toured all areas that cared for stroke patients. In addition, the surveyors reviewed files and chart reviews and interviewed staff and patients. J.D. Day, M.D., is the chairman of the UAMS College of Medicine’s Department of Neurosurgery and director of the neurosciences clinical program that includes the stroke service and multidisciplinary team leaders. To be a comprehensive stroke center, a hospital or clinic must be able to provide 24/7 care for patients suffering from a stroke and any cerebrovascular disorder, including ruptured brain aneurysms and bleeding into and around the brain. The Joint Commission requires the provider hospital or clinic to have the following available to do that: an acute stroke team, neurointensive care unit beds for complex stroke patients, the ability to meet the concurrent needs of two complex stroke patients, and have neurosurgical services. A center must be able to offer comprehensive diagnostic services; on-site coverage by a neurospecialist for its neurointensive care unit; participate in patient-centered research that is approved by an institutional review board; and track, monitor and report performance measures.